MD 460 · Hall Hwy. 0.78 mi. ; from Byrd Rd. southeast to MD 413. Added in 1961. Connects Crisfield with J. W. McCready Memorial Hospital. MD 461 · Was Lake Fanny Rd. Consists of the old US 1 bridge over Winters Run, dated 1913, built by Luten Bridge Co. of York, Pennsylvania; one of many early bridges across the state built by that firm. It was bypassed by the current Winters Run bridge in 1930. The southern intersection with 1 has been removed, but the bridge remains, and serves a private driveway. The latest reference to the old bridge as 461 was in a 1949 SRC map. MD 462 · Paradise Rd. 4.15 mi. ; from MD 132 north to MD 155. MD 463 · Main St.
No longer assigned (decommissioned 1998), never posted. Part of the old MD 45 (US 111 back then) before removal of grade crossing for the Northern Central Railroad. The tracks were abandoned in 1972 and the right-of-way is now a hiking-cycling trail. The road is split in two by the trail, with a wooden fence across the road. Parking is available at the end of the southern section. MD 464 · Souder Rd, Point of Rocks Rd. 8.10 mi. ; from MD 17/MD 79 intersection, Rosemont/Brunswick east to Ballenger Creek Rd near US 15, Point of Rocks. from MD 178 east to road end. MD 465 may have lasted into the 1980s before being dropped. from US 1 north to road end. MD 466 is the old portion of 166 before consturction of I-95 and I-195 in the area. I am unsure if 466 was ever signposted. No longer assigned (renumbered May 15, 1968), now part of MD 54. MD 467 shown on a 1958 map. It, along with MD 455 at right, are now part of MD/DE 54. 11.19 mi. ; from MD 214 south then looping east to road end. Marked north-south between MD 214 and MD 256, unsure about eastern section. The original extent of MD 468 was from between MD 214 (then MD 253) south to MD 255. South of this, MD 255 ran south and looped around to Shady Side instead of 468, and 255's current dead end in Galesville was MD 393. By 1955, it had assumed its current configuration. I'm not sure about how the south loop is directionally signed, but the mileage table assumes Shady Side is the 'southern' end. MD 468, from the 1948 SRC map. from MD 6 south to indeterminate point. 3.75 mi. ; from MD 242 north back to MD 242. 0.99 mi. ; from MD 5 north to end of state maintenance. 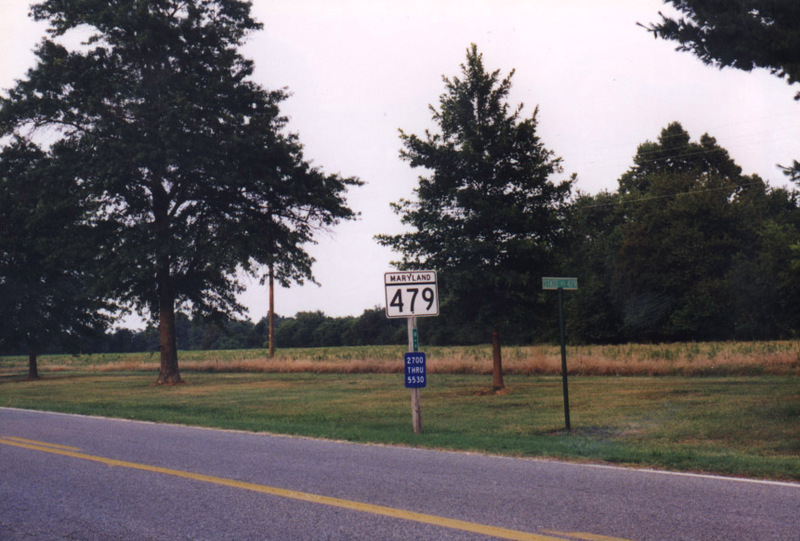 MD 471 also once consisted of part of St Andrews Bridge Rd, which is now a part of MD 4. According to maps, it was a 'broken' route. 00.00 mi. ; from MD 235 northeast to end of state maintenance. from MD 273 north to near Blake Rd. MD 473, from the 1948 SRC map. MD 474 was a short, floating route east of Denton, accessible via MD 313. Hobbs lies along an abandoned rail line which ran southeast of Denton, passing through Hobbs crossing the state line at Hickman. The southern end of 474 was likely at the rail crossing. MD 474, from the 1948 SRC map. The actual route is highlighted in yellow. The abandoned rail line is in green. 1.06 mi. ; from Patrick St (MD 144 westbound) south to I-70 Exit 54 and MD 85. East Street in Frederick was extended southward to MD 85's new interchange with I-70 which opened in 2009. All new signage makes no mention of MD 475, whereas MD 85 south of the interchange is definitively marked thereupon. Inventory direction in the HLR is from north to south, which makes sense as the northern portion between the 144s opened first. 0.87 mi. ; old number for part of MD 358. No longer assigned (decommissioned), entire route now part of MD 358. Only mention is from a 1937 map. from MD 144 north to indeteminate point near Old Frederick Rd. MD 477 · was Old Washington Rd. loop south off US 1. No longer assigned (decommissioned 1980s). Part of the old US 1, bypassed to eliminate a dangerous curve and residences near Elkridge. The number was dumped not long after 1985. 1.88 mi. ; from MD 180, Knoxville east to end of state maintenance at Florida Ave, Brunswick. Runs along the north bank of the Potomac River to Brunswick. At Florida Ave, the route ends and becomes W Potomac St. Used to be designated MD 70 before becoming part of MD 464 in 1950. MD 479 · was Bay Shore Rd. Former entrance to Eastern Shore State Hospital. No longer assigned (decommissioned 2000). Title transferred, now private (per 1999 SHA HLR Route Alert List). This was the entrance to the Eastern Shore State Hospital. In 1999, the hospital ground, which had been abandoned (I think it was a mental hospital, but I'm not entirely sure), was sold to Hyatt who planned to build a hotel complex there. The resort has been completed, but 479 still shows up on Google Earth. The trees that lined the route remain as a straight line cutting across the golf course in the satellite view of Google Maps.